Arriving to FAF... it seems like we have always been there! The first of the visits we did, was just next to Sao Paulo (where we arrived), we visited our friends from FAF, who are located in Mococa (3 hours and a half drive from Sao Paulo) and that you might certainly know better, for their Bob-o-link coffee. It is always a pleasure, to meet with the Croces. Their good vibes and enthusiasm, can be easily transmitted by spending a minutes with them. 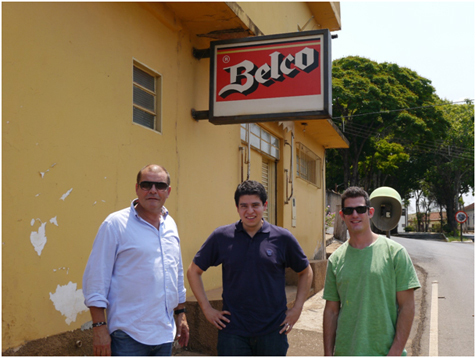 We were received by Marcos and his sons, Felipe & Daniel, and headed with them to FAF (Fazenda Ambiental Fortaleza). What Marcos has done in his region, and with all of his producing partners, is admirable & respectable. 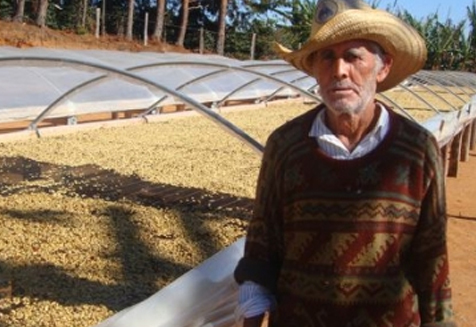 Arrive to FAF and visit the different farms working with them, is something, if we can say so, that offers a very different image in what concerns Brazilian coffee production. Driving over mountains, under shade farms, organic farming, honey production… you know somehow, that you're getting into something. When Marcos & his wife, Sylvia, moved from the States after she heritate the farm, they didn't know much about farming, but they were happy with the change, and above all, had strong life convictions that wanted to adapt to their farm. They didn't want to continue working the farm the way it was. First, 50 families living there, they didn't want employees, they wanted partners involved on their project. They propose much more, starting from education, demanding just their engagement. As he says, some wanted, some others didn't. Then, the production system. 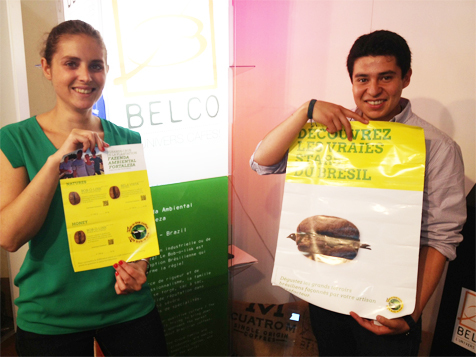 They were convinced about organic farming, even tough, unknown at the time at Brazil. Production, as now they know, went down (they are producing now, around 10% of what the farm used to produce. Let's give it a name. Fazenda Fortaleza, was re baptized, as Fazenda Ambiental Fortaleza. How can I improve my quality? 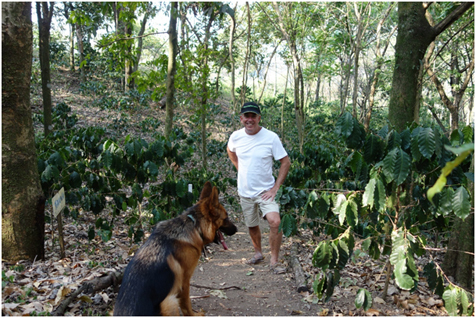 Marcos traveled to Central America, to see how production was in other countries, there he saw something that wanted to apply for sure, shaded coffee farms. And here, I would say, the person that helped him the most, was Felipe, his son. 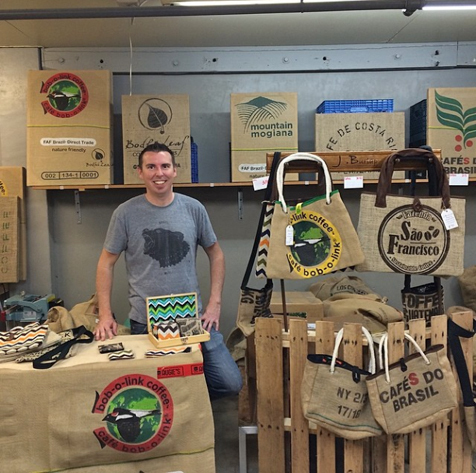 Formed by an American roaster, he knew a lot about coffee, and felt that his parents were into something, and that he could still help them much more. Daniel, his brother, followed the path too. An expert with the spoon, the other with the calculator. FAF had it all, to start the path to become a farm model system. To be complete, and reach the sustainability, they started with some other productions. Wood (used for everything, from the African beds that they use to drying the coffee, until tables in the house), bees and their honey (a perfect indicator of biodiversity), water preservation, vegetables production, milk & cheese, rural tourism (they receive visitors during the whole year). The project was working, despite the fact that volumes of coffee were decreasing. And neighbor farms started to get interested. And that's when the Bob-o-link project started. The Bob-o-link is a migratory bird that travels all over America, which is very touched by mono intensive agriculture, and the Croces used to live on Bob-o-link road. Everything was given, to have a name. As he says, first thing he did was to empty the fridges of farmers wanting to join his project. You are what you eat, he says, how could he change the philosophy of someone that drinks coke instead of a juice made out of the fruits of his garden. Start planting trees for shade, and all over the farm. Do barriers, to preserve water. 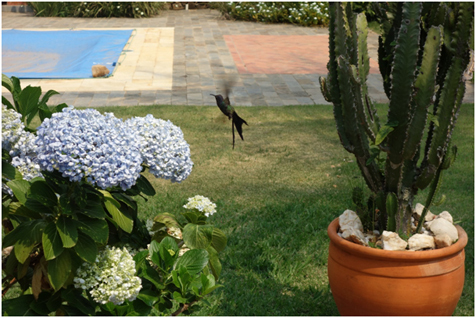 Start decreasing the use of fertilizers & pesticides. Install African beds & pre-sorting machines on the farms (with their financing help). Selective harvest. Being mountain & small farms, harvest is done by hand. They help them, to change their food habits. Interest in coffee cupping & recognition. Have some alternative productions. It is quite common to see lots of animals on the farms, such as cows for milk products & meet, and vegetables production. With all these, birds & bees would come. For the first, they ask respect, from the seconds, to get into honey production. Every step is very important, Marcos says, but if there's not quality, nobody would be willing to pay more for what they do. And there's where them in a strong relation with them, work in order to improve the quality. They form the farmers, in a way that they can improve each step of the production. 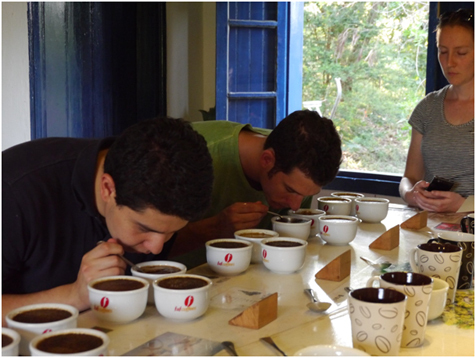 And for the post-harvest selection, Felipe is the man behind, cupping every batch to know where is it going to go. 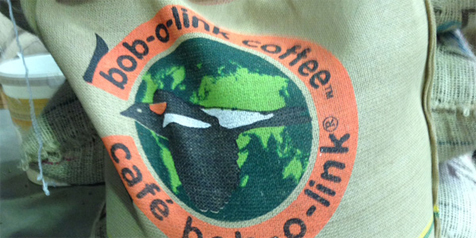 A bob-o-link coffee, needs to score 84-86, according to the SCAA scale. If it's lower, they won't consider it worthy to put the name on. 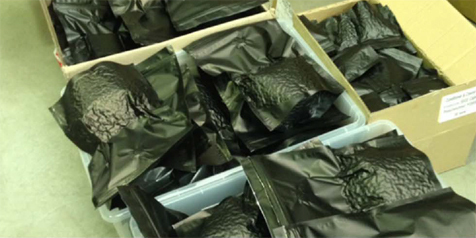 If they find any outstanding "microlots", they would separate them, and sell them separately as their "special reservas". What started as a single farm project, has now over 50 farmers involved, from which (according to Marcos), 28 are completely converted into the bob-o-link philosophy. Changing and getting so many farmers adepts, took them 10 years. Now, their wish, is to be a model of sustainable production for the country. What we also liked about them, is something Marcos said, he liked to form every farmer as much as they can. Otherwise it would be but a man project, and you know what happens when that man is missing. Marcos "El Cacique" of Mococa, and his dog lupa! Before leaving, I said to Marcos what I like to say to lot of farmers we work with: we always like to work with people that are like salmons, those that always go against the flow, those that always follow the hardest path. Where would be the fun otherwise? We are very happy to announce you, that besides continue our natural bob-o-link coffee, we would increase what we are doing! Two new bob-o-links are flying to Europe this harvest, the pulped natural bob-o-link & the yellow bob-o-link (made out exclusively from yellow varietals). Stay tuned with us for the second part of our Brazilian chronicle: "The untold stories of the pan do queijo: you need to drive at 160 km/h through the Cerrado highways… that's what the PGI specifies!" Le samedi 15 mars 2014 est à marquer d'une pierre blanche pour Javry, ou plutôt d'un grain brun ;) Après une nuit quasi blanche nous avons effectué la première torréfaction. Le premier café que nous allions bientôt proposer à nos clients. Un moment stressant mais très excitant pour notre petite entreprise. 9h00 du matin, en route pour Bièvre dans les Ardennes. 1 heure de route et beaucoup de questions et d'interrogations sur le trajet: "Et si nous nous étions trompé de café ? ", "Et si ce n'était finalement pas un bon choix ? ", "Et si le torréfacteur brûle notre café ? ", "Et si nous n'arrivons pas à emballer le café dans nos emballage spéciaux ? ", Et si, et si ... Bref, beaucoup de questions et d'interrogations. Mais bon, ça doit être assez normal pour une première. Původní název Bob-o-link pochází od názvu migrujících pěvců (bobolink kanadský (Dolichonyx oryzivoru)), kteří létají ze Severní Ameriky do Jížní Ameriky (až na jih Argentiny!). Biodiverzita je pro zpracovatele FAF, jichž součástí je i farma Ambiental Fortaleza velmi důležitá. FAF vytváří pro tyto ptáky místa, na kterých se během své cesty mohou zastavit na rozdíl od farem vytvářející ohromná pole monokultur, která napomáhají jejich vyhubení. Plná a komplexní chuť s minimální kyselostí a dlouhotrvající intenzivní dochutí. Káva ideální pro jednodruhové espresso. Lískové ořechy, burské ořechy a sušené ovoce. It´s still winter here in Boston, a fact that I try to ignore during my daily bicycle commute to the Fazenda Roastery. 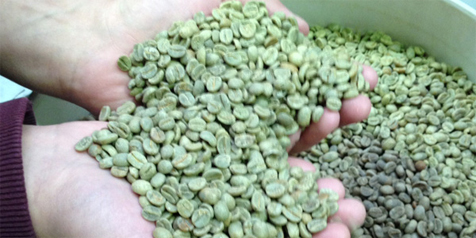 In spite of the weather here, I find myself thinking warmer thoughts in anticipation of the coming coffee harvest. You see, in the Southern Hemisphere it´s more like fall than winter or for that matter, spring -it´s harvest time. When I opened the door at the Roastery this Monday, I was surprised to find that the first of a series of new coffees had arrived. There it was, in all its glory, a fresh pallet of a new Brazilian coffee. 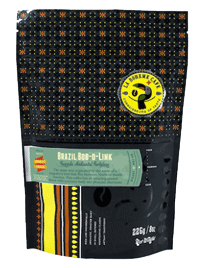 What I have in stock from them currently is the FAF Bob-O-Link coffee, a natural process arabica featuring Catui and Mundo Novo beans which I cupped last week (for the curious, here´s a good overview of arabica varietals). We discovered this coffee through a partnership with Sofa Café, a Brazilian style café opening this year on Newbury Street that has a lot of style and that is coming to Boston straight from Sao Paulo, Brazil, where there are three other locations. 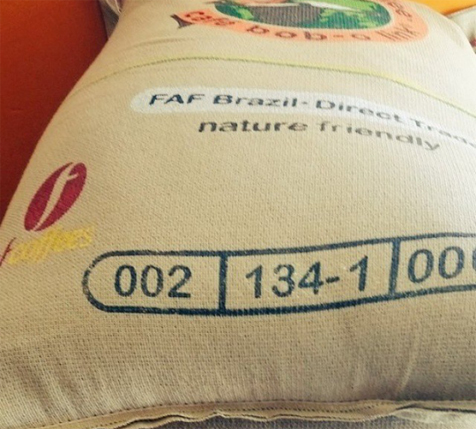 They´ve asked us here at Fazenda to roast this coffee for their location, and after cupping the coffee, we couldn´t possibly be more excited to do it for them. The Bob-O-Link is exceptionally smooth, with a creamy body and flavors reminiscent of fine chocolate. At a lighter roast profile, it has bright and vibrant characteristics that are the perfect counterpoint to its depth. The Bob-O-Link is advertised with a cupping score of 85 but I would score it slightly higher. Some other microlots from FAF were cupping as high as 88 and I fully concur after trying both the FAF 349 and FAF 322. Great coffee! 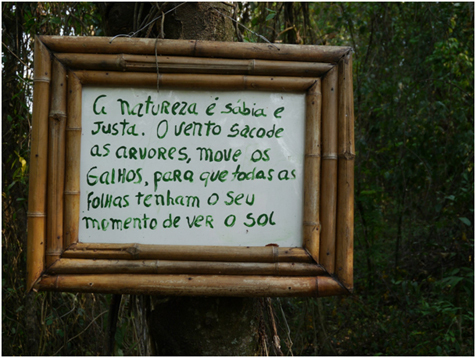 And there won´t be any surprises on my end if this year´s harvest is even better, given the depth of care that goes into the use of agroecological farming methods at the Fazenda Ambienta Fortaleza. An additional challenge for this coffee: I´m attempting to match the roast profile of Sofas´ Sao Paulo Roasters, but on different equipment and in a completely different climate. I have my work cut out for me. Surprised, though, to find that this profile is very similar to the one I use for our Colombia Full City roast at our café location, my standby morning cup of coffee. Time to get started! Look for Bob-O-Link exclusively at Sofa when it opens in a few weeks! Son nom est tiré de l'oiseau migrateur volant depuis l'Amérique du Nord jusqu'au Sud de l'Argentine. Le blend Bob-o-Link est un café brésilien de haute altitude. La plantation Fazenda Ambiental Fortaleza a été créée par la famille Baretto en 1850, qui dirige toujours aujourd'hui la ferme du terroir de Mococa. Les caféiers sont cultivés entre 1000 et 1400 mètres d´altitude au coeur des montagnes Mogiana dans le Sud du Brésil puis les grains sont cueillis, triés à la main et séchés naturellement. Les variétés de cet arabica donnent à ce mélange des notes subtiles de chocolat, d'amande et de praline.